My spouse will only carry one credit card, and the only requirement is that it has to be a MasterCard or Visa. His primary card in 2018 was an AU card on my Aviator Silver account. With the 2019 AA EQD benefit devaluation that was recently announced, that card is going to be history. In this thread I will run his 2018 spending against the reward structures of several replacement card candidates for comparison. To get started I went through all of the Aviator spending on the AU card for 2018, and isolated just the spending that I was pretty certain was discretionary, routine, card-in-the-wallet spending (I removed some recurring household expenses like Netflix and our ISP, as well some other expenses I knew I could have channeled elsewhere). I'm going to run these totals against the rewards structure on several cards we already have in order to pick a replacement for the Aviator. For simplicity I am not going to consider cards with rotating 5% categories, or the value of signup bonuses, and I'm going to value URs and other points that have variable value as simply as possible. If you disagree with my point valuations feel free to do your own math in your own head or start your own thread. I'm not going to argue over point valuations here. The reason I've excluded the value of SUBs from this analysis is that I've also excluded 2018 spending that went on his other cards that were opened just for the SUBs. By setting aside SUB spending and SUBs themselves, I can concentrate just on routine spending rewards, which is all that matters when choosing the best card to use for routine spending for 2019. Let's start on the shallow end of the pool. I could add him as an AU on my Walmart MasterCard in honor of the sensational seasonal deals at Walmart, where they are selling holiday water for under $44/gallon). The Walmart MasterCard is probably my worst rewards card (I don't consider my Macy's Amex or Macy's store card to be a rewards card; in fact, I don't consider them at all). I'm going to value URs at their cash value toward travel of $0.015/point (which is better than some redemption options like gift cards, but potentially not as good as point transfers to travel partners. The latter redemption types bring complexity that I don't want to deal with in this thread, and frankly, I don't often do). US Bank's points have a fixed $0.015/point value for travel, which is how we would use them. Here is the Chase Sapphire Reserve (3x on airfare, travel, dining, 1x on other spending). Adding an AU is +$75. Here is the US Bank Altitude Reserve (3x on travel, 1x on other categories). This card also pays 3x (4.5% back) on all mobile wallet purchases, but I'm not going to factor that in here because he paid that way a total of zero times in 2018. I'm paying for most of our groceries with Apple Pay (and this card) now, but despite being eight years older I'm the early adopter in the household. Read no further than the first sentence of this thread and was willing to lay a bet that CSR was going to come out on top. Did a "virtual" double on the bet when I saw the spend break out. Since I also have the Sapphire Reserve I can redeem URs for $0.015/point toward travel. It's possible that some of the spending would coincide with one of the rotating 5% categories (which essentially never include travel). Groceries and gas were categories for part of 2018, but as you can see from the annual totals below it wouldn't have made a significant difference to have these as 5% categories for just one quarter (or even two). What about the Pentagon Federal Credit Union Platinum Rewards Visa? The analysis on this card was particularly eye-opening. I had impossibly low expectations for this card, but I was still disappointed. The points are worth $0.0085 each if you want the only cash equivalent in the rewards catalog (Visa gift card; a $50 card is 5,880 points), making this a 4.25% gas / 2.55% grocery / 0.85% general spending card. This 5x gas/3x grocery card now appears to be the worst rewards card I have. The Walmart MasterCard is a better card for this spending pattern, because it gives a statement credit every month for 1% of all spending. The points you earn on this card are on a rolling expiration schedule, so the few points you earn may never be enough for a single reward. I've had my PenFed card for over 5 years and I still don't have enough points for anything in the catalog. 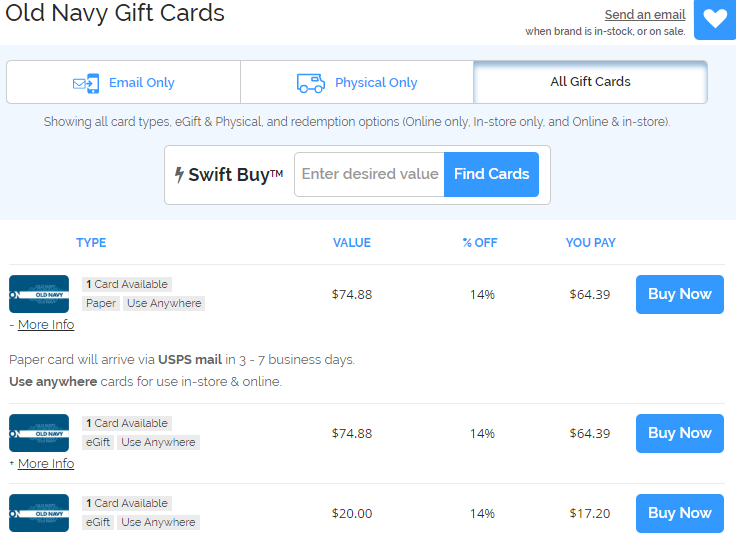 You can also pick up "discounted" retail gift cards from the rewards catalog and s-t-r-e-t-c-h the value of each point to $0.00947 (still less than a penny) each. 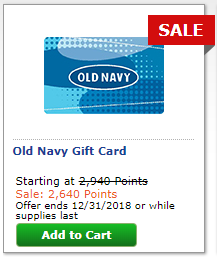 The problem is you can pick up an Old Navy gift card from an online store like Cardpool for 86 cents/dollar, which makes an actual penny worth more than penny, and significantly more than a silly PenFed point. I won't use up the space in this thread to go into detail on the most ridiculous redemption I have found in the PenFed catalog (less than 1/3 of a cent per point for a set of hand puppets you can pick up at Walmart for $12.77), but here is a link. Do you hold a BOA Premium Rewards card w/Platinum or Platinum Honors status? We have a Cash Rewards Visa and a Travel Rewards Visa... and TAD has a Premium Rewards card but it's almost a year old so it's nearly time to close it. I may open up a Premium Rewards Visa of my own this week for a SUB, and I could add an AU to that. With the Platinum/Platinum Honors 50%/75% uplift over the 2% travel+dining/1.5% everything else rewards it might be in the running. The Premium, Cash, and Travel Rewards cards from BoA (with upper tier status) are among the most underrated cards for routine spending out there. He has a Chase Marriott Premier Visa (recently upgraded from the legacy card for 50,000 bonus Marriott points). We generally get around $0.008/Marriott point, so let's see how that works here. The card comes with a "free" night in exchange for the AF, so I'm not going to deduct the AF from the spending rewards since the card will pay for itself even with no spending. The card earns 6x (4.8%) at Marriott and SPG properties and 2x (1.6%) on all other spending. I went back through the 2018 charges, and there were no Marriott or SPG stays (I'm the Marriott whore enthusiast in the family), so this is a pretty simple calculation. Let's look at the PayPal Extras MasterCard. A quick tour through the rewards catalog showed a lot a terrible redemption options ($5 Target gift card for 800 points - $00625/per point), and to get cash back it takes 6,000 points for the minimum $50.00 redemption ($0.0083/point). 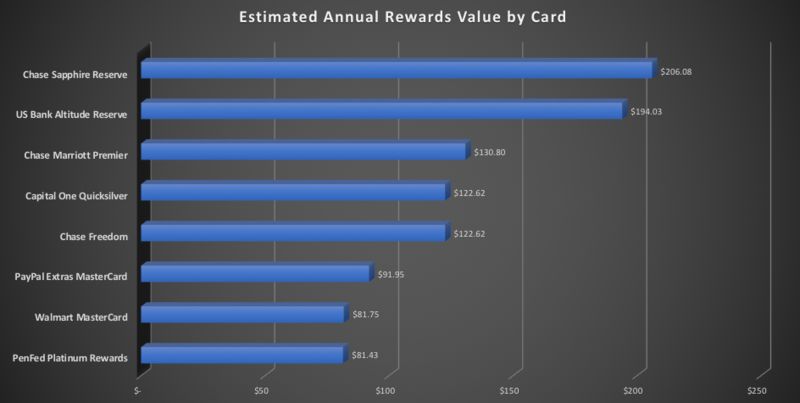 There were some gas and grocery gift cards at $0.01/point, and because we wouldn't stack up thousands of dollars in rewards I would be willing to do these specific redemptions to optimize the value of the points. We could easily spend the carefully-selected gift cards at Chevron, Vons (Safeway), etc. For that reason I am willing to assign a value of $0.01/point, even though the redemption choices at this rate are pretty limited. I had 522 points in my account, so while I was working on this post I took the opportunity to cash in 500 of them for a $5.00 Vons (Safeway) gift card. Thanks for the suggestions. I'm going to put the Uber Visa on the list of cards to analyze (I'm planning to first cycle through the non-Amex/Discovery cards we already have, and then start up with some potential acquisitions). I'll do the Uber first when I transition. I already have a couple of options > 2% for this profile, but 2% is definitely in the ballpark compared to many of our other options. Capital One Quicksilver, flat 1.5% back. Summary of results below. I will add to this as I analyze additional cards. You need a Freedom Unlimited card all spend would be at 2.25% when transferred to your CSR. Still not as lucrative as the CSR given the spend profile presented and the fact that he won't carry multiple cards. Otherwise would agree as this is the model DW and I use (CSR for travel/dining, FU for regular spend and a varying option for gas). If AmEx will ever let me off the damn BL (my 15th anniversary is next year) we may incorporate MRs into the fold, but otherwise non change to strategy and keep it simple. CV - If you could convince TD to use 2 cards, CSR for travel and FU for everything else you can up the return to 2.79% and still keep it very simple. You would (incorrectly) think this would be a lot simpler when you're dealing with someone who is so obsessed with optimizing certain things that we cannot run the dishwasher just because we're out of clean forks (there ALSO must be zero empty/underutilized space on both racks). I may get there in a couple more years. Right now I'm happy he will use the one MC/V card that I pluck from the safe and put into his wallet. Prior to our current treaty, everything he spent went on his Wells Fargo Visa for 1% back -- or (gasp) was automatically debited from our checking account.